Asus is working on a trio of laptops which will plump up its ROG and TUF ranges later this year. The leaked lineup, which includes the (TUF) FX505DU, (ROG) GU502DU, and (ROG) GU502DV models, is noteworthy thanks to being the first seen to combine AMD Zen+ Picasso APUs with Nvidia Turing GPUs. Serial leaker Tum Apisak spotted these new laptops in the 3DMark databases (via NoteBookCheck). 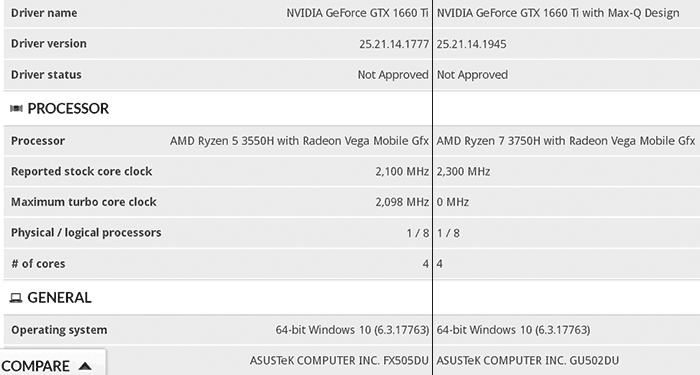 Below you can see a screenshot of the online database entry for the Asus ROG GU502DU and the Asus TUF Gaming FX505DU. The GU502DU features an AMD Ryzen 7 3750H processor with 4C/8T and base/boost of 2.3GHz/4GHz. This APU comes packing Radeon RX Vega 10 graphics – however if this is insufficient the laptop will turn to the GeForce GTX 1660 Ti Max-Q that is also installed in the system. Mentioned without any screenshot evidence backup, the Asus ROG GU502DV model is claimed to come packing Nvidia GeForce RTX 2060 graphics. Other than that significant difference we can expect the system’s specs to be similar to the GU502DU, as the model name is so similar. Moving on to the TUF Gaming laptop, the FX505DU, here Asus has paired an AMD Ryzen 5 3550H processor with an Nvidia GeForce GTX 1660 Ti (no Max-Q mentioned). The AMD APU has 4C/8T and runs at a base/boost of 2.1GHz/3.7GHz and comes packing Radeon Vega 8 graphics. 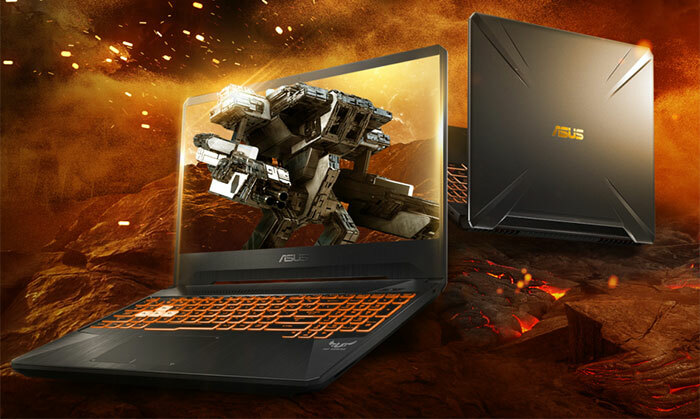 Some such devices were announced at CES 2019 and have already started to become available, like the Asus TUF FX505DY (RX560X) Gaming Laptop, pictured above. Perhaps these unannounced Picasso plus Turing laptops from Asus will present an even more interesting proposition to gamers on the go in the coming weeks/months.